James A. Haeni was born August 28, 1953 in Hustisford, Wisconsin to Adolph Jr. and Evangeline (Miescke) Haeni. He passed away on Saturday, January 26, 2019 at his home in Walworth. 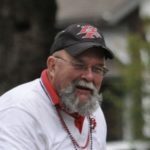 Along with teaching history at Big Foot High School for 33 years, he was an assistant football coach for most of his career. He retired from teaching fulltime in 2010 and took immense pride in the achievements of all his students and players. He and his wife, Rose, were instrumental in founding the Big Foot Wolves Youth Football Program in 1998 where he served as Chairman. He was highly involved in the Walworth community, serving on the Walworth Memorial Library Board as Vice President and was an active member at Faith Lutheran Church. He was blessed with a loving family and many dear friends that will miss him greatly. James is survived by his wife Rose Marie (Hardt) Haeni, whom he married on October 27, 1979 at Triune Lutheran Church in Sharon Township; his sons Matt (Fiancée Andrea Lantz) Haeni and Nate Haeni; grandchildren Zach, Emma, Madeline, Ethan, Sophia, Olivia, and Victoria; great-grandson Richard; brothers Adolph “Butch” (Barb) Haeni III and Frank (Kathleen) Haeni; sister Kathleen Haeni; as well as many nieces and nephews. A gathering celebrating James’ life will be held from 1:00 p.m. until 4:00 p.m. on Saturday, February 9, at Faith Lutheran Church, 420 Read St, Walworth. In lieu of flowers memorials may be given to Faith Lutheran Church or the Big Foot Wolves Youth Tackle Football Program. A special person. I will always remember him and that voice! What a laugh he had. Hugs Rose and sons. Just so sorry for your loss of Jim. Mr. Haeni, during my time in this area, you were Big Foot High School. Your smile was as big as your heart. We all knew how much you cared. My heart is deeply fractured over this news; words seem so inadequate. The Big Foot community has lost a piece of its soul with your passing. I will forever shout out your name in tones of love. I know you are resting peacefully in heaven, Sir, and I pray for your loving Family. Jim was larger than life, and cared deeply for everyone he came in contact with. He was always there to help us in Big Foot Athletics any job, any sport, any time. From running a scoreboard to selling tickets, he’d do whatever we needed, but he especially loved announcing from the press box. One of my favorite memories of Jim was the track meets. Jim had to watch from the press box as events finished so he could announce the next one to start. Kids would always be walking around in the middle of the track and be in the way. Jim would often yell “”Hit the dirt you kids! I can’t see!” They always Immediately did it, then waited for him to announce the next race and got back up. Or he would announce the jump pits were closing by saying “Open pit has 5 more minutes and barbecue is done!” He loved all the kids and was your friend for life. Rest In Peace, Jim. You made your life count. Uncle Jim was the best uncle a niece could ask for. When I got married I asked Uncle Jim to be one of my ushers. He was so excited and let me tell you he took his job seriously and above! He was there right away that morning to help decorate the hall. He made sure before we left that everything was in place and ready. I had an ice sculpture and since it was warmer that day than it was suppose to he was worried it was going to melt all over so he was trying to think of what to do, lol... After the ceremony he made sure my card box or anything else that needed to go to the hall was there. The end of the night when all the decorations had to be taken down he stayed right there with us to help get everything down. He came to me and said Wanda, you go to your hotel, I have the rest of this. He made sure my presents, card box, extra table decorations ect. were in boxes and taken to my house, he didn't care what time it was. Uncle Jim was always there when you needed a jokster around. Uncle Jim you will be deeply missed and you are very loved! My Uncle Jim was one of the best Uncle's a niece could ask for, He was always making sure family, friends even strangers were part of something. I remember the day I got married, I had asked him to be my Usher. He was so excited, He took it seriously. He made sure that everything was perfect, from making sure cards box got to the hall, making sure everyone knew where they were suppose to go, (i had an ice sculpture and it was melting-he was trying to find a way for it not to melt, lol). At the end of my night he gathered up my presents, cards, any keepsakes, the left over things and took them to my house. He helped taking decorations down before we could leave the hall and told us that he would help finish up with everyone else so we could leave. He was so caring of people and I am glad to have been able to have him as my uncle. Uncle Jim, I can;t believe you not here, You are so missed and I love you. Jim is truly going to be missed by brother Butch & and sister-in-law, Barbs. It really tickled Jim, to be able to get " Free" tickets to Ice Hogs Hockey games, We would go to the games and then the next day to resale store's, junk stores, etc. The four of us went up to Door County and stayed a weekend at a college friends, cottage, did a little wine tasting and toured around. Jim was always at the big events of our children and grandchildren. Weddings, Funerals, Graduation parties, and in the earlier years, Our annual family Thanksgiving event, until the kids started having families of their own. Jim was always good hearted, and would offer help to anyone, who needed it. Miss You already: "BROTHER"
Jim made everybody's life easier. He will be sorely missed.